Earlier today, I was pondering what sci-fi or fantasy weapons I would arm myself with if I could only pick five. Everyone thinks about these sort of things while at lunch, right? I thought so. The choices across all of worlds of fiction border on infinity. Even my poor memory called up way too many phasers and rayguns to make my choices easy. To narrow the scope, I decided the weapon had to be one that any normal person could pick up and use. That at least eliminated wands, but not much else. Then I decided I could pick one weapon from each fictional world. After careful consideration, I came up with these. If I had to go out into the void of space, a paranormal gritty urban setting, or a fantasy world filled with green hills and inns with hot, crusty bread these would be the weapons I would bring along. I haven't worked out where I would keep them all on my person. I'll get back to you on that. "Hokey religions and ancient weapons are no substitute for a good blaster at your side." Well, dammit Janet, it's just true. The DL-44 is lightweight, reliable, and accurate. It also has the handy feature of letting you know if you have five shots left by vibrating the handle. Neat, huh? If they had commercials during the Galactic Civil War, this weapon would be branded "weapon of choice among the Rebellion, smugglers, and bounty hunters." Not that the Emperor would let them advertise that. When your blaster runs out of shots, you have to be prepared with a weapon that doesn't require ammunition. Even though Arwen's sword, Hadhafang, was created just for the Lord of the Rings movies, I hope you don't hold that against it. It was wielded by Elrond during the battle of the Last Alliance of Elves and Men. It's been around and survived a scrape or two. The name of the sword was also a newly coined Sindarin word meaning throng-cleaver. I am not ashamed to admit that one reason for choosing Arwen's sword is the fine craftmanship, i.e. it's really pretty. What if I meet vampires while I'm out adventuring? Yes, I could behead them with Hadhafang, but what if the blade is dull (Elven blades don't dull I realize, but just go with me)? I need a simpler, more effective weapon. Something I can strike with and then recoil. Mr. Pointy from Buffy the Vampire Slayer is perfect for the task. It's a little fancier than your average wooden stake, and it was made by Kendra Young. She gave it to Buffy to kill Angelus. 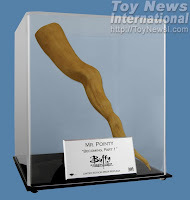 Though that didn't happen, Mr. Pointy was mentioned in a few more episodes. So I've got vamps, Wraiths, and Imperial Stormtroopers covered now - but not demons. I'd hate to meet one of those unprepared. There's no way I would rely on my memory to create a Devil's trap and then remember the words and pronunciations for an exorcism. No. 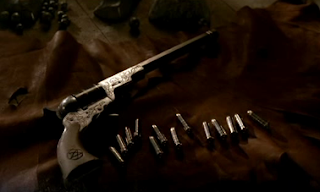 It would be much better to have the Colt from Supernatural. Besides having a wicked design, it's had a fascinating past. This gun was built by Samuel Colt along with 13 bullets. Anything that is hit by one the bullets will die, including demons. I guess that means I should really work on my aim. The phrase "I will fear no evil" is inscribed on the Colt in Latin. It shouldn't be that hard to find. The Winchesters always seem to be misplacing it. To round out my collection, I wanted something small and deadly. 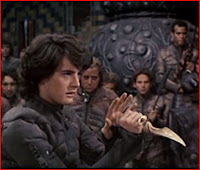 The crysknife from Dune was more a sentimental choice than anything else. 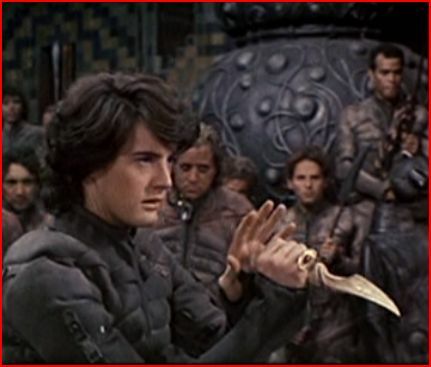 Dune is one of my most favorite books, and the crysknife is part of an important ritual. It is a sacred weapon of the Fremen; the knife is made from a tooth of the planet's giant sandworms. If a crysknife is unsheathed, it must draw blood before it is sheathed again. For my purposes, a weapon only to pull out in close combat, possibly as a last resort. Who wants to visit Arrakis with me to steal a tooth from a Shai'Hulud? I bet you're surprised that a lightsaber is missing from this list. I left it off for one reason - I know that I would slice off a valuable limb in less than ten seconds. I mean, I cut myself with a cheese grater for goodness' sake. Which weapons would you choose? Right, there's a reason only Jedi (well...Force-users) can use lightsabers. Especially since the blade has no weight, it would be really hard to control. I'm totally with you--Hadhafang is so pretty! My brother gave me a knockoff reproduction of it, but it's a pretty good knockoff and I love it! 5. From Mass Effect, I was tempted to say the Cain (it fires nukes! ), but I would definitely blow myself up. So just give me a Vindicator Assault Rifle. 4. They don't even have a pretty name I know of, but the two long knives Legolas used in the LotR movies were very pretty, and I like the idea of wielding two swords. 3. Zoe's sawed-off rifle. Seems simple and trusty. 1. Celestial Fury, a katana from Baldur's Gate II that stuns opponents (very handy). Every weapon known to (fictional) humankind pales in comparison to the batarang. Having held a Hadhafang I'm not a fan of the weight distribution, I might have to go with sting, as I have a thing for short swords. Of course in any fantasy realm my one weakness would be a penchant for some warm stew on a cloudy day. Even though they're horribly dangerous, I really would like a blunderbuss. Nothing like a good ol hand cannon. From Star Wars, I think I might have to go with a bowcaster...or heck, an ewok booby trap, as those seemed to take down the empire. Eleni - I'm so with you on the sword of martin. Heehee, I have to agree with Bubbashelby....the Batarang is the only weapon you'll ever need in a tight spot. However, I think I would probably have to adopt my very own Winona. I could always use the Batarang as back up when faced with Scarrans. The only weapon you need is Winona from Farscape. There are so many amazing weapons I have not heard of before. And now need to look up - especially ones that came up more than once. I like that a weapon is named Winona. 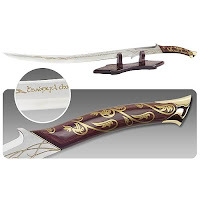 Budd - I really want to do a replica (or barring that, buy one, of the Vorpal Sword. It might beat out Arwen's sword on prettiness.